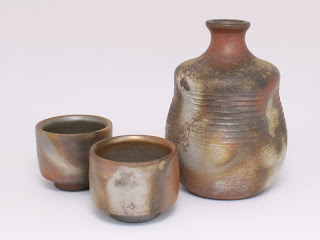 Bizen ware is designated into 5 types depending on the pattern. Goma: This pattern is made by firewood and ash. They are melted by being heated in a kiln and become light brown, beige and bright yellow in color. Some patterns look like sesame seeds on the ware. Sesame is goma in Japanese. That’s the reason this method is called goma. Sangiri: The area in a kiln is divided by pieces of wood. When the potteries are laid beside the wood while burning, some areas are not directly reached by the flames this is the method of reduced flame burning (low oxygen). These conditions make gray, gold and silver colors. The name Sangiri is actually two words (San-Giri). “San” means wood partition in Japanese, and “Giri” means dividing. Hidasuki: Straw is placed on the pottery before burning. Iron from ashes of the burning straw reacts with the oxidized flame and then makes red marks on wares. The contrast between red and light brown looks very graceful. This way was found by accident. Potters put straw between potteries in order to prevent them from adhering to each other before burning. This method is the result of that accident. Botamochi: Botamochi is a Japanese sweet and has a round shape. This method is named for the dumpling shaped ceramic put on the ware before the burning process. Thus some areas are not covered by ash during the burning. This makes for a distinct color difference between the covered and uncovered areas. In this method bowls are sometimes used for covering larger areas. Ao-Bizen: Regular Bizen ware is burned by an oxidized flame. Ao-Bizen ware is burned with a reduced flame (low oxygen) and has a blue color. Iron produces a red color in an oxidized atmosphere and makes a blue color in an oxygen reduced atmosphere. “Ao” is blue in Japanese. I don't mean this in a bad way, of course! Societal concerns aside... I just hope that as the price of memory decreases, the possibility of copying our brains onto a digital medium becomes a true reality. It's one of the things I really wish I could encounter in my lifetime.